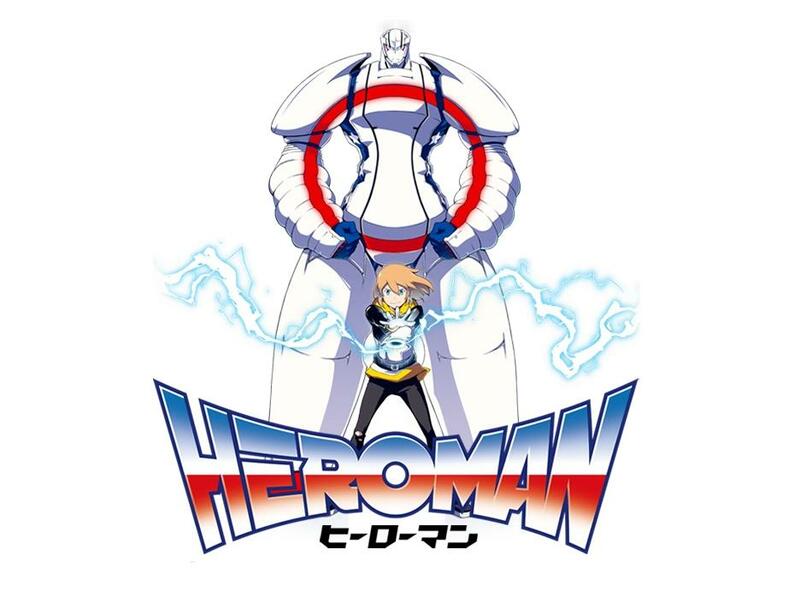 Heroman is an interesting anime for many reasons including the fact that Stan (The Man) Lee had a lot to do with it. It was his big jump from comics to the manga world (Along with Ultimo) and it’s interesting to see his take on anime. Stan even makes a few appearences in the show and he can usually be seen at the coffee shop. That being said, will this be the next Spider Man or the next Spider Ham? Well, the series has quite a few different story arcs even though its only 26 episodes. Joey Jones is your average school kid who gets bullied by the brother of one of his friends. His other friend is the tough guy who tries to protect him and that’s the inner cast for the first episode. The plot begins right away so the bullies are taken out of the picture pretty quickly. The brother (aka Will) gets a big role, but his friends fade into obscurity except for Nick. Joey finds a pretty neat toy and as he starts to fix it, a lightning bolt strikes the toy and grants it unimaginable power! He decides to call the toy Heroman and he gets an electronic glove which lets him give orders to Heroman and also comes with other perks that make Joey a true fighter. Joey doesn’t have a lot of time to celebrate about this because Earth is attacked by an alien race known as the Skrugg. The Skrugg don’t have a great defense, but there is strength in numbers and they are able to fire compressed air which can rip a hole through a building. It’ll be hard to resist as you watch Heroman take them all down, but you should not underestimate these opponents. The government is basically overwhelmed in a short amount of time and it becomes painfully evident that Heroman is humanity’s last hope. Can he defeat Kogorr and the alien race or is he doomed to die? Meanwhile, Will believes that he can take down the Skrugg without any help! The next arc deals with the government as they hire Agent Hughes to find out exactly what Heroman is and to take him down! That’s essentially what he is aiming to do at any rate as he puts Joey, Psi, and the Professor on the run. Did I mention Psi yet? He’s the tough guy who helps Joey, but an unfortunate accident put him on crutches and now things are dicey for him, but at least he has a hovering skateboard. This arc had a lot more tension than the previous one and while the action died down and essentially vanished, it was a pretty fun arc. We had some mini adventures after that like an island arc and Will returning. It all led up to the ultimate showdown where the Skrugg decide to take down the planet…starting with The President. This time Heroman may not be enough to stop the Skrugg, but if he cannot….then who can!? Joey and friends will be there to back him up and that’ll just have to be enough this time. Let’s talk about Joey Jones. He’s the main character of the show and he’s a pretty likable character. From the start of the show, you can already tell that he’s a pretty nice kid. He quickly makes a play for the toy robot once its discarded and it ends up paying off big time! He always looks out for his friends and he tries to save the world and help people whenever possible. There’s really nothing wrong with Joey and that’s why he’s a really solid character. He doesn’t really have any character flaws, but he’s still not perfect. It’s not that he does something wrong, but it’s what he hasn’t done. I could have used a little more rebellion against the government when they tried to frame him. With his super speed at the ready, Joey is more than a match for any government lackey that opposes him. 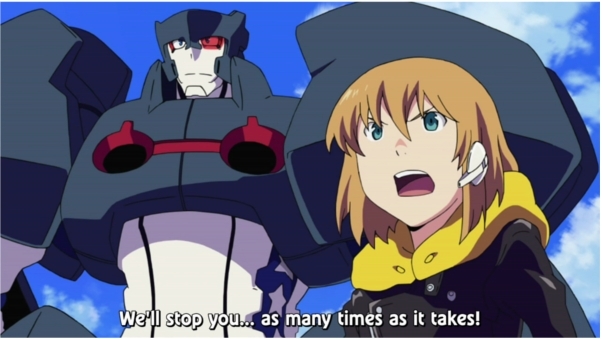 Still, it’ll be tough to find a main character as heroic as Joey in a modern anime. Joey can’t fight for the beginning of the series as he uses his glove to give Heroman commands, but he finds out that it also grants him super speed and the ability to make powerful barriers. Joey quickly becomes a dangerous force with this weapon at his side. We’ve also got Psy who is definitely one of the main characters, but he’s not very likable. He has a bit of a tragic back story and things didn’t always go his way, but it’s still hard to root for him. He looks really bad when the team went to find the Professor and he tends to get in Joey’s way during the fights. Professor Denton is also a pretty underwhelming character as he’s just there to get Joey into trouble. He doesn’t show his intelligence off that often and half of the time you can’t even take him seriously. He gets captured more than once and usually it ends up being his fault. He even ditched Joey and Psy once because they wouldn’t go with him on a crazy adventure! Will is one of the antagonists of the series. He may have good intentions at times, but that doesn’t excuse the fact that he’s your average bully. He also gives way to the dark power for a while and he becomes completely unreasonable during the later half of the show. He only backs down when he’s captured and is in no position to really do anything anymore. He is decently quick and the show gives him a lot of props since he’s constantly able to outfight Heroman, but I never really bought that. It just made Heroman look weak as opposed to making Will look tough. He is a lot cooler in the second half of the show design wise, but overall he’s not a character that will really get better through the course of this show. Perhaps Will will become a better character in a sequel show if this series ever gets one. Will had a friend by the name of Nick, but he was even worse than Will. This guy had no strength of heart and his willpower is just sad. One could argue that he was already inherently evil and I wouldn’t really be able to disagree. He doesn’t get to appear for long which is a good thing, but at least he got some backstory. Joey had a sister by the name of Holly, but she didn’t really add anything to the show either. We got a very last minute history for the family as we got to see Joey’s parents and some character development but it wasn’t needed. Holly likes to mess with Joey a lot, but in the end it’s just playful fun. (Although Joey and Psy really overdo it with the acting sometimes) Joey’s grandma is also around a lot, but she never really realizes when anything is happening. The government is definitely around and even the President gets involved! He was a decent character and he stayed firm as the White House started to be destroyed. With the aliens at his doorstep, he was still ordering his underlings to inform him on what was happening. For the most part, all of the government duties are actually carried out by Agent Hughes. Agent Hughes goes undercover at Joey’s Coffee Shop (It’s not his, but he does all of the serving) and digs up some info on Heroman. After that, he does a 180 and proceeds to try and annihilate Joey and friends for the betterment of society. Officially, he was just trying to take them alive, but bombs usually end up destroying the target! He’s supposed to be a pretty likable character by the end, but he looks so bad for the most of it. He caused Joey and the others a lot of trouble so it was hard to let him off the leash. (He was a lot like Rossiu although not quite that bad) I liked him a lot at first, but he went steadily downhill from there and the ending couldn’t really save him. I barely even want to take about Dr Minami. He was really annoying and I couldn’t take him seriously at all. He was one of the end arc bosses in the show, but he’s just a human with a machine. Does he really believe that he could actually defeat someone as powerful as Heroman? The series actually ends on an epic note with an after type of scene, but because it involves Minami, I really can’t take it seriously. The President should have known that he was fishy. Finally, Gogorr is the leader of the Skrugg. His abilities are in a league of their own and they can’t be compared to the average Skrugg. His speed is what makes Gogorr so deadly and he was completely destroying Heroman when they fought originally. Not even Joey’s barrier was a match for his power and Gogorr proved to be an intriguing opponent. He looked his best during his first big fight against the heroes and it’s the way that you should probably remember him. He was a little on the generic side as far as master villains go, but he had a cool design and he was a threat. In the end, I can’t really ask for any more from a villain. (We do have to ignore that he begs for his life towards the end of the first climax) An honorable mention for cool villain will go to the plant monster that was kind of alive through artificial intelligence. The show had a pretty decent soundtrack. The music score is pretty limited so you will be listening to the same music themes a lot over the course of the series, but they’re decently fun. I found a handful of themes that I liked and they did introduce one new theme during the final few episodes of the series. It may not be 5 star material as far as soundtracks go, but it’ll definitely be enough to satisfy me in this area. The animation for the show is also pretty good and I’d say that it’s around average. Considering that it’s a modern anime, it doesn’t look spectacular, but it does have its moments. Whenever there is a scene with lightning, then it’ll typically look pretty good. 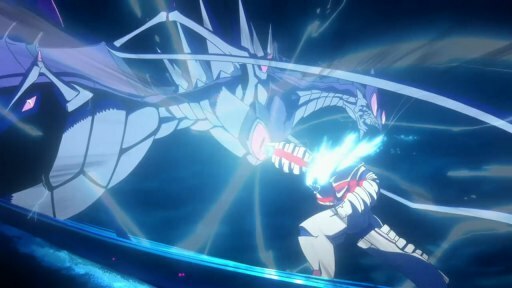 I believe that the animation would look even better, but they seemed to have a bit of trouble animating fight scenes. 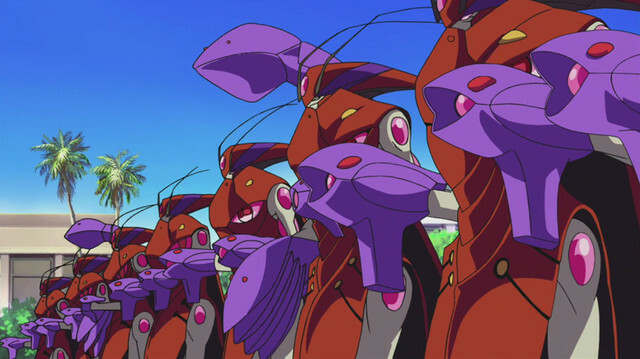 It may be due to the character designs of the Skrugg and Heroman, but they didn’t really mesh well with the art. The humans looked pretty good which is why I think this. Again, the animation is definitely not bad, but it’s not great either. This isn’t exactly Bleach or Index, but it’s good enough.